Planning, Design & Construction (PDC) is committed to being a leader in sustainable design and construction through the use of green materials, systems and methods. The environmental mission of the facility compels a fundamental response to our region, context, environment, sense of place and the special qualities of the Southwest and the Sonoran Desert. The project borrows from the iconic imagery of our region: striking landforms of canyon and mesa, the dramatic play of light, shade and shadow, the painted sky of sunsets, desert monsoons, highly adapted plants and animals. The University units to be located in ENR2 are: Institute of the Environment, School of Geography & Development, and School of Natural Resources and the Environment. Space will also be allocated, on an interim basis, for a portion of the Department of Mathematics. 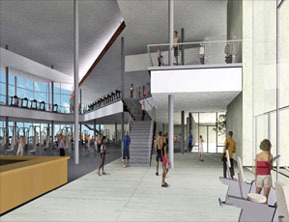 The building will also include a 600 person undergrad auditorium for the Office of Academic Affairs and a coffee cafe. 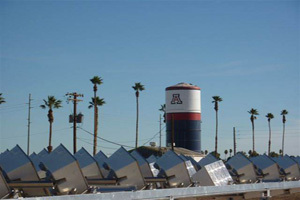 ENR2 is a part of the University of Arizona's ongoing and concerted effort to promote interdisciplinary research that focuses on Earth Science and Environmental Programs. A key goal of this facility is to establish an atmosphere for collaboration of scientific and interdisciplinary research which creates great opportunities for graduate students across multiple disciplines. Capitalizing on existing core disciplinary strengths will further establish the University of Arizona as a preeminent institution in basic earth sciences and environmental programs research. The location of the large high-tech auditorium in this project will provide undergraduate students the opportunity to experience a sustainable multi-discipline learning and research environment and participate in the outreach efforts developed by the occupants. 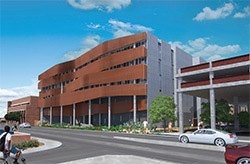 Scheduled for completion in June 2015, this building strives to go "beyond LEED" to explore innovative solutions to architecture in a desert environment. There are many sustainable components, both active and passive, with minimization of energy and water use being integral elements of the building design. Many of the important features of the building are passive systems that require little if any assistance from non-renewable energy sources. 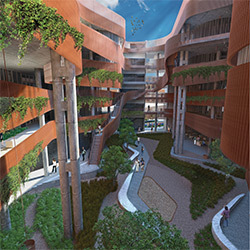 These passive systems include reconfiguring the building, which is responsive to each exposure, to include a central "canyon" courtyard that integrates exterior circulation and interaction space. Vertical metal fins and overhangs shade the building on the south facade and similar fins on the north address the less direct sun exposure. Minimal openings are located on the east and west where needed. The same shade elements are utilized within the canyon to create the effect of the curvilinear canyon wall. Substantial concrete walls, overhangs and structure provide both cool thermal mass and critical shade from the summer sun. By creating exterior circulation and interaction spaces and tempering the exterior terraces with shade, planting and fans, the amount of conditioned space is reduced by approximately 30 percent. Landscape beds at each level will be irrigated with stored rainwater runoff, captured building condensate or reclaimed water and further temper the canyon to create exterior spaces that can be utilized year round. Where possible, the building's structure is exposed. Concrete perimeter walls, ceilings and concrete superstructure reduce the need for additional materials altogether. Where additional materials are required, environmentally responsible materials are incorporated. In addition, as part of the building's flexibility, a raised access floor and large open office areas are used throughout the building in lieu of suspended ceiling tiles and partitions. The raised floor accentuates the flexibility of the building by placing the mechanical, electrical and communications within the floor space. This will facilitate future remodels making them less invasive and more cost efficient. Finally, the building is engineered to accommodate a future research-based Photo Voltaic array on the roof along with other designated roof top research areas. Active Systems that contribute to the sustainability of the facility create a work environment that will maximize comfort, putting the occupants in control of temperature and lighting. Natural lighting along with highly efficient light fixtures, light level and occupancy controls reduce electrical power consumption. 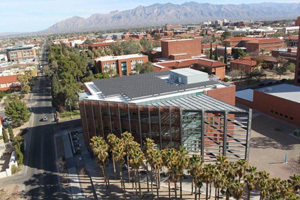 The HVAC system design is projected to realize on the order of a 25% reduction in annual energy budget when compared to a defined "baseline" system and involves an approach to indoor thermal control that has not been used on this scale at the University of Arizona Tucson campus. A dedicated outdoor air system, combined with overhead induction coils known as "active" chilled beams provide the primary heating, ventilating and air conditioning function for perimeter office spaces on floors 2 through 5. This innovative system substantially reduces fan energy and provides a more accurate method of controlling fresh ventilation air. 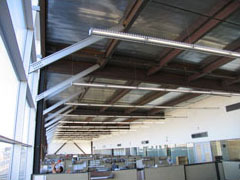 Displacement ventilation systems are used in the open office and classroom areas. Benefits to this type of buoyancy-driven, low momentum system include high ventilation effectiveness, ability to extend airside economizer operation to an outside ambient temperature of 65 F, and low noise. Reductions in water use are achieved by UA standard inclusion of waterless urinals, dual flush toilets and low flow/demand sensing faucets. But, in addition, as a part of the building water harvesting effort, a 52,000 gallon underground holding/filtration tank is located on the south side of the building. 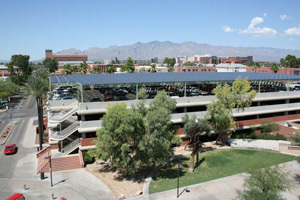 The UA Solar Initiative is a multi-building, campus wide project to provide green energy generation and advance solar technology awareness and education on campus and throughout the community. 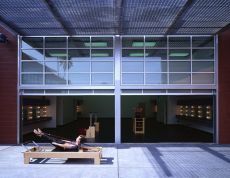 The various installations utilize roof-top photo-voltaic arrays to directly convert sunlight into electricity. 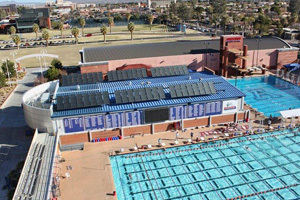 The installations at the Student Recreation Center and Hillandbrand Diving Center include Solar Thermal Arrays which collect thermal energy utilizing evacuated tube solar thermal collectors. This energy is used to provide over 20-30% of the energy necessary for heating the pools and offsets the use of natural gas heating. The HSEB draws its design inspiration from surrounding mountains and canyons, and it responds to local climactic conditions characterized by intense sunlight and extreme temperatures. Inspired by the iconic canyon formations found throughout Arizona, the facade reinterprets stratified earth layers as a copper sunscreen protecting the building from direct solar exposure. The copper skin is formed, bent, pressed and perforated to create a visual connection to the surrounding mountain range. The "canyon" is the building's central organizing element. It is clad in burnished concrete building block to provide cool thermal mass and reflectivity; it is shaped to maximize self-shading, allowing light from, and visual connection to, the exterior. 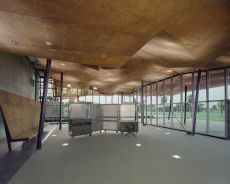 Defined by two academic wings and the "mixing bar", this exterior space is protected overhead by a fabric structure, and tempered with landscaping and semi-conditioned relief air. This relief air of the building is introduced at the first-floor level, cooling the space, as the ambient temperature can be well over 100 degrees Fahrenheit. The copper cladding creates long horizontal sunscreens on the south elevation to provide shading for the generous openings. North elevations were provided with vertical fins to block the low sun towards the end and beginning of summer days. With the desire to minimize direct sun intrusion into the interior spaces, the building was computer modeled, and sun exposure simulated for every day of the year. The modeling tested the efficacy of the shading devices and informed their design. Generally, very few openings were introduced at the east and west facades. These walls have incisions that introduce light through facets protected from direct east or west sun. The ground level of the east facade abuts the main campus quad and is the primary entry for the building. This lower elevation was provided with glazed walls that welcome the outdoors, but were provided large copper overhangs to provide maximum shading. 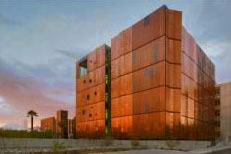 The building is designed to be highly sustainable by minimizing waste of every kind. Mechanical systems are engineered to be highly efficient and easy to maintain. 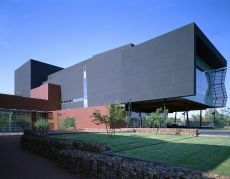 The canyon space, shaded from above and the sides, is made comfortable through the introduction of tempered "waste" building relief air which would normally have been exhausted to the roof of the building. Lighting is designed to be highly efficient and augmented wherever possible by controlled daylight. Interior materials selected were chosen for durability and beauty, as well as for their high-recycled content. 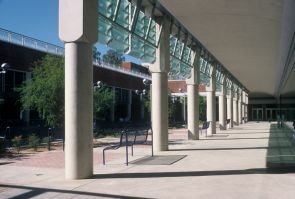 The University's Manuel Pacheco Integrated Learning Center was designed in 1996 to provide an undergraduate classroom facility to celebrate the core curriculum for freshmen students. Strategically located in the heart of Campus, the building exhibits many design features that demonstrate the University's historic commitment to a sustainable built environment. 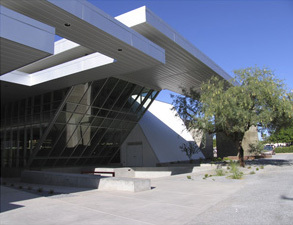 This unique below grade structure incorporates the first "green roof" in Arizona public architecture as a major design element. 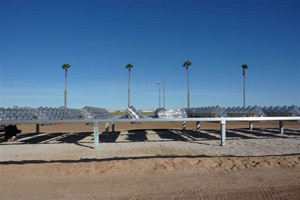 The extensive turf panel which is irrigated with reclaimed water, provides excellent thermal mass and insulating qualities that help mitigate the extreme diurnal temperature swings experienced in the Sonoran Desert. The building frames an external central courtyard and arcades that increase the usable square footage without the environmental impact of increased structure. These design features integrate various shading elements, including trellises, natural vegetation along with relief air from the building's HVAC systems to provide usable and sustainable outdoor space for circulation, classroom queuing and social interaction. Natural light introduced into the courtyard is directed into the building's perimeter spaces utilizing tinted glass louvres and the arcade's parabolic ceiling which reduces the reliance on artificial lighting. Insulated skylights located in the roof structure help bring additional natural light into the building's interior spaces. High performance HVAC systems continuously monitor the heating and cooling energy available in the outdoor air. 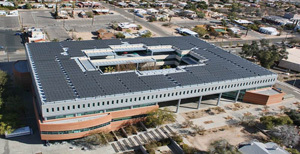 Sophisticated software control algorithms can determine the optimum time to utilize this "free energy" to ensure maximum efficiency, flexibility and environmental comfort throughout the building for each of the Sonoran Desert's five annual seasons. Light sensitive research functions are organized along the southern, windowless side of the building. 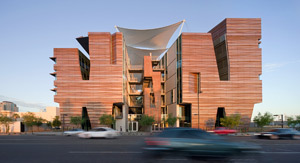 The building's unique copper sheathing is designed as a breathable shield for the inner wall, shading the envelope of the building from the harsh desert sun and moving heat by convection away from the building core. The glass curtain wall, and programmatic spaces for which views and daylight are desired, face north toward the Catalina Mountains. A limited number of punched windows are used on the east and west facades to minimize the solar exposure, heat gain and glare. The use of daylight is central to the design concept for the building and is introduced from several sources. The glass curtain wall provides views and indirect natural light to offices and a conference center located along the north elevation of the building. Internal clerestory windows allow light to extend further into the central corridor at each floor. Internal light shafts provide a dramatic source of daylight for the internal spaces of the building. Relief air from the high performance HVAC system is utilized to temper the exterior plaza space. This cooled air, which is typically exhausted where convenient, is conveyed via an underground duct to the outside amphitheater. The sunken plaza creates a depression which helps contain the cooler air. The plaza's design maximizes the use of permeable surfaces. Rip rap was used around the planted terraces and decomposed granite at the tree grove and around pathways. This promotes the absorption of surface water and minimizes the impact of runoff water from the site. 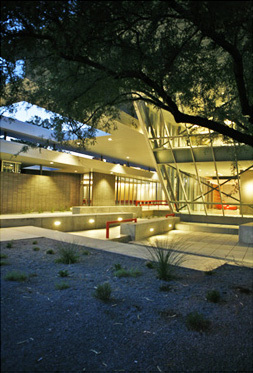 The landscaping concept for the building utilizes low water use and regional plants and trees, such as the Desert Museum Palo Verde. 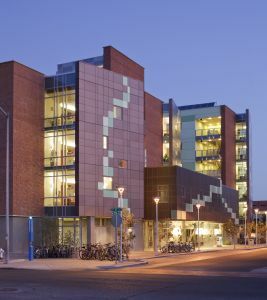 The Helen S. Schaefer Building, home of the UA Poetry Center and Humanities Seminar, incorporates many elements which contribute to a sustainable built environment here at the University of Arizona. Both the vertical surfaces and the horizontal ground plane of the Poetry Center are protected from direct sunlight by an umbrella of broad and deep energy-saving roof overhangs. Keeping direct sun off of the building exterior is one of the most effective ways of preventing heat gain and reducing cooling needs. It prevents solar gain to interior surfaces through glass, and it prevents masonry and concrete from absorbing sun energy and re-radiating it throughout the day. Well protected exterior spaces surround the building and help to create a more temperate outdoor climate. This increases the useable building and help to create a more temperate outdoor climate. This increases the useable square-footage of the building without the environmental impact of increased structure. 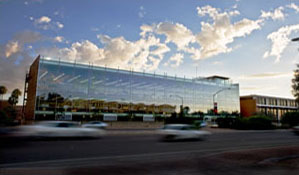 Much of the exterior of the building is constructed of glass which is unusual for desert construction. However, in every case, this glass is protected from direct sunlight by orientation, overhang, or obstruction. The building is situated in a directly north-south / east-west orientation allowing it to efficiently mitigate sun impact by using sun angles to its advantage. Interior glass partitions used throughout the building welcome protected natural light into the building and allow it to pass unobstructed through the majority of spaces within. This conveys maximum energy savings due to the reduced dependence on electrical lighting. In addition it conveys the maximum health benefits of natural daylighting to all the building's occupants. Lower energy compact fluorescent lights are used wherever possible to reduce energy consumption and mitigate heat gained through lighting. The entire building is insulated to reduce energy usage related to heating and cooling. All the glazing is double paned. High efficiency cooling units are located in shaded areas - further increasing their efficiency. 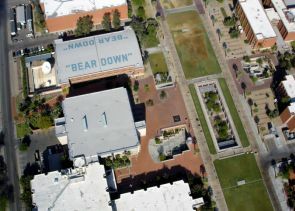 The Student Recreation Center Expansion was the University of Arizona's first LEED registered project and has achieved a Platinum certification. Use and control of daylight is fundamental to the building's character. Major building spaces are oriented to capitalize on the introduction of light from the north and south - the most controllable sun exposures. Solid walls on the east and west exposures and deep roof overhangs keep direct sunlight out of the building - minimizing thermal gain and controlling glare. Natural light introduces dramatically to the Fitness Room through a "fracture" of the roof plane and conveys through clerestory windows at the ceiling of this large, two story space. 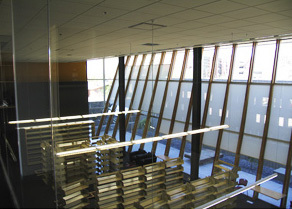 Large expanses of low emissivity glass allow views from and natural light into every space while maintaining an efficient building envelope. A translucent wall on the north side of the Multiple Activity Court provides a constant, even lighting level for gym activities. Occupancy sensors and multi-level, daylight-sensing lighting controls reduce unnecessary use of electric lighting throughout the building. Construction materials have been selected to mitigate the project's impact on natural resources. Local sources for concreteand concrete masonry (two major building components) reduce material transportation demands and support local manufacturing. High recycled content in the rubber sports flooring, office carpet, the structural steel frame, and concrete encourages material reuse. Diverting more than 75% of construction wastes from landfills by segregating recyclable materials is a goal of the construction process. The existing parking lot surface, which would usually be one of the most voluminous construction wastes, was pulverized and incorporated into the structural soil under the building's foundations. Water harvesting principles are manifest throughout the site. 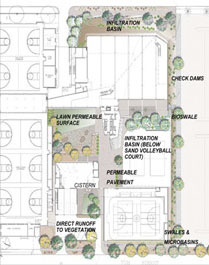 The courtyard features permeable surfaces that serve as both recreation areas and rainwater infiltration basins. Swales and microbasins slow runoff and allow percolation - maximizing the benefits of available rainfall for the surrounding landscape. The Architecture Building Expansion is a reflection of the school's curriculum and a working laboratory for sustainable practices. The south side of the site is occupied by a water conservation demonstration garden showcasing five different Arizona ecosystems, where students and the public can learn about water efficient irrigation and native plants. Water captured from the roof deck and condensate from the HVAC system filters into a 12,000 gallon holding tank used for the garden's irrigation system, resulting in an 87% reduction in the use of potable water for the garden. The architectural vocabulary of the building is based on exposed building systems. The use of exposed mechanical, structural and architectural systems becomes a teaching tool for the students who occupy this building. The use of glass, steel and concrete, as well as exposed utility systems, minimizes the quantity of materials, and the need for multiple layers of finishes resulting in a building assembly of naturally low VOC emitting materials. 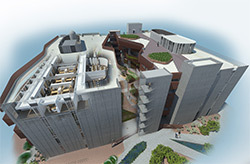 The building is connected into the University's Central Plant systems which efficiently generate the energy to serve the building's heating, cooling and electrical needs. High performance HVAC and lighting systems integrated with state of the art digital controls work in unison with the building's architectural elements to ensure maximum efficiency, flexibility and environmental comfort. HVAC system performance is further enhanced by continuously monitoring and dynamically utilizing seasonally available outdoor air heating and cooling energy. The building's window placement serves as a teaching tool and demonstrates the use of passive solar concepts. Maximum openings on the north, controlled openings on the south, and minimal east/west openings work to achieve natural lighting of spaces with minimal solar gain. 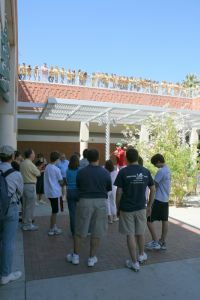 In addition to performing as a laboratory for exploring Sonoran Desert green roof strategies and photo-voltaic systems, the roof is an outdoor studio where student solar projects can be developed and demonstrated. The building's south exposure is protected with shade canopies and a green wall that allows vines to grow up for additional shading. 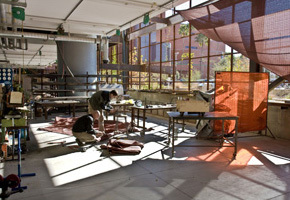 Cooled by a high efficiency, indirect evaporative cooling system, the ground floor of the building is another student laboratory where architecture students can explore the capabilities of construction materials. By opening glass garage doors, this laboratory expands to include a sheltered exterior space. 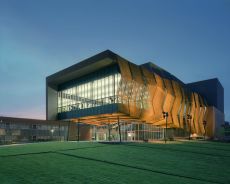 The Gittings Complex Expansion is inspired by dance and movement. Its sustainable design is apparent in its materially and uniquely inherent in its form. A glass enclosed dance studio is supported by "dancing" steel columns above the entry porch and lobby. The studio's transparency takes tremendous advantage of natural daylight while also serving as a beacon to the UA mall and gateway entry. The dance studios south facing glass is protected from the summer sun by a deep overhang. 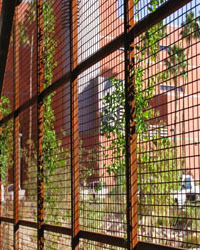 The east glass is creatively protected from solar gain by a woven steel fabric. This fabric has been allowed to naturally oxidize and therefore requires no paint or other treatment. 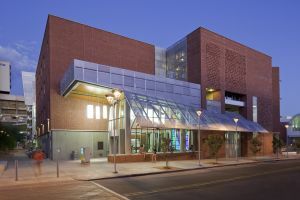 The fabric wraps from the exterior, where it provides opportunities for dramatic night event lighting, through the lobby and into the performance theatre. In the theatre, the sculpted shape becomes the acoustic form necessary for the performance hall. Insulated glass encloses the lobby making it transparent to the public while it is deeply sheltered by the overhanging dance studio above. The ticket sales room has been constructed as a mobile and collapsible glass booth - allowing multiple uses of the same lobby and front porch areas. The entry porch, which is sheltered by the overhanging studio, serves as pre-function space for events. The careful design of this space relative to the use of shade, lighting and tempering allowed for less enclosed lobby space to be built. This reduces the building's need for air conditioning and construction resources. The dressing rooms have been creatively designed to double as a somatics (study of the physical body) and warm up space. Large glass overhead doors can be opened to expand the space to the outdoors and take advantage of temperate days thereby reducing the need to build more enclosed and conditioned space. The major building elements are constructed of eco-friendly materials such as steel, exposed concrete and concrete block. The systems and controls in the building are high efficiency and reduce the energy needed for operation. Rainwater is collected in the healing garden spaces and planter areas, while this and the other open space are irrigated by reclaimed water and state of the art irrigation systems which monitor rainfall and need. Region specific plantings were selected for their drought tolerance and shading ability. 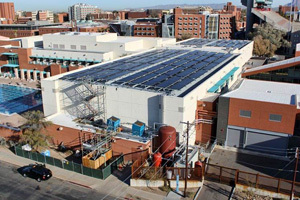 The University of Arizona has long been a leader in designing and constructing buildings using strategies which reduce energy and water use and improve productivity and health benefits. 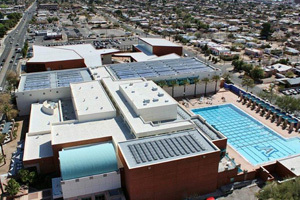 Before the terms "sustainable" or "green" became widely used, the University of Arizona was already designing and constructing high performance, energy efficient buildings intended to last 50 to 100 years. 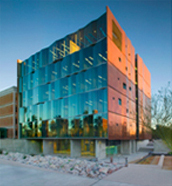 The University of Arizona's Design & Specification Standards (DSS) require design and construction utilizing high quality materials, systems and methods. These standards are continually updated and improved to reflect our commitment to sustainable design. US Green Building Council LEED (Leadership in Energy and Environmental Design) is a standardized, nationally-accepted benchmark for the design, construction, and operation of high performance green buildings.